Well, we couldn't resist putting the big one first, but here you see our first one. 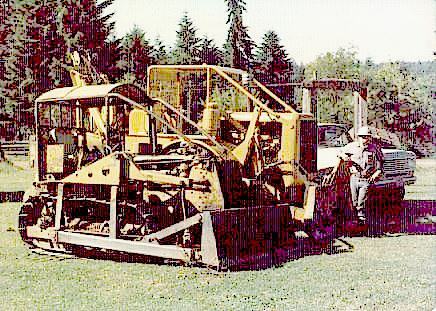 What you see here (for a rear view look for the Wagner Log Skidder picture on the Skidder page) is a very early D-4 Cat. With Serial # 4G4495 this machine is dated about 1938. It was originally a farm Cat in Eastern Oregon or Idaho, but it came West in 1949, and was armored for logging and equipped with a Wallace blade, and ultimately with a Hyster D4N towing Winch. The horsepower rating was in the 35-40 Hp range. Acquired by the VanNatta's in 1950, this Cat was the main stay of a salvage logging operation in the early 1950's, and after an overhaul and a new set of tracks was again used for logging in the mid 1960's until the Log skidder joined the family. This machine weighed in at around 5 tons, and featured a low speed 4 cylinder Diesel Engine with a 2 cylinder gas engine pony motor to start it. The 4G series was the first serial number series of true Diesel D-4s made by Cat. It would pull one small log very slowly, whereas the skidder would pull 3 or 4 similar sized logs in one turn and move much more quickly. Despite its small size, and ancient character, this dozer built many miles of 'cat trails' around the VanNatta tree farm, and was our only bulldozer for about 25 years. Fondly known as "Bedelia", we are sure she has found her way to Cat heaven by now. We even used Bedelia on occasion for farming. With the blade removed she was much more responsive and would just go sailing with a 3-16 plow and do it on ground far too soft to support a rubber tired tractor. You see, one of the design problems of Bedelia was that with the blade (which was of a rather heavy design) Bedelia was nose heavy. She only had a 4 roller track frame, and with the necessity of putting the hydraulic pump out in front of the radiator and then building a hydraulic tank around it, the blade was really out there. If you are in the know, you will understand what a 'dippity-dive' cat road is, otherwise don't ask! Small wonder though, that we bought a road grader. 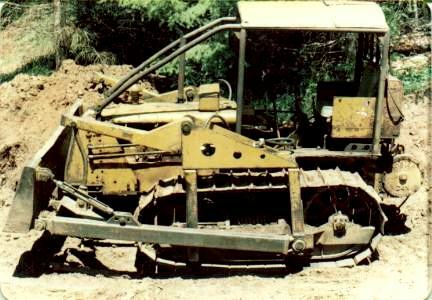 It was the legendary durability of these old dozers that made Cat what they are today. These machines were mostly made out of cast iron and used a low RPM engine (900 RPM) and the performance was poor. On steep hills dozers of this vintage would run out of power even in first gear before they ran out of traction. ...but they were so strong that they rarely hurt themselves, and this drove the legendary reputation for durability. For bull skinners turn cat skinner this was important. After all with a bull team of the load is too heavy, nothing happens and if the machine had been built so that it tore itself apart when overloaded the result would not have been pretty. Indeed the competitive brands of the day tended to do this and that is why they are no more (almost). These old dozers were of a particularly unique design in a way. They were of a 'unit body' construction. Cat loved cast iron and these machines used lots of it. They were really only cast in 2 major sections: the engine and the transmission/rear end. The radiator was of cast iron and was bolted to the front of the engine. This is why on these old dozers you see the blade lift mechanisms on the track frames. There is nothing on the front of the engine except a cast iron radiator to fasten anything. The bottom of the radiator was bolted solidly to some cast ears on the front of the engine block and the top of the radiator utilized a cast iron thermostat housing that supported it. The back of the dozer (from the bell housing to the winch was all a single casting. The final drives were enclosed with side castings, and access to the transmission and cross shaft were from the top. The entire top deck was removable, after you stripped the machine down by removing the canopy, fenders, dash board seat and fuel tank, you could take the lid off the rear unit exposing the clutch, transmission, and cross shaft. The clutch was a dry plate engaged by an overcenter cam pressure plate. It was adjusted by loosening the split bolt clamp on the transmission shaft and screwing the pressure plate forward. The transmission was an unremarkable group of straight cut low pressure gears providing 5 speeds forward and one reverse. Behind the transmission was a bevel gear which turned the cross shaft. There is no differential in Cat tradition. Out bound from the bevel gear was the steering clutch/brake unit. the steering clutch was of an internal type, and the brake was a classic external band. Beyond that the cross shaft protruded out the side of the case where it had a small gear on the end of it which drove the bull gear making up the final drive assembly. Even today, partial unit body construction is not unknown in bulldozers, but it is often not cast iron and often not the whole machine. Common is a massive cast steel rear end assembly which contains the cross shaft and bevel gear, but a fabricated steel shell is more common on the forward portions of the machine. This means that you can remove the engine or transmission from most newer machines. Maybe there is a place for unit body construction and surely many farm tractors were of this design, but with respect to a dozer, the idea of using the transmission case and the engine block for structural components of the machine seems a bit much. The art of starting a 50 year old Cat is not as straight forward as it seems. The Cat Diesel engines used from he time diesels first came out in the 1930's through the 1950's were a first generation diesel engine. In dozer applications they were of which we would now call a low speed engine with a maximum RPM of 900 or 1000. These engines were massive pieces of Cast iron whose weight was measured in tons. Turbochargers and high performance were unknown. Legendary durability was known. Though these engines more or less by definition were compression ignition engines, they did not have the high compression ratios that we know today and consequently they were, well, hard to start. Cat managed this issue by mounting a second engine often called a pony engine on the machines. This was typically a 2 cylinder carburated spark ignition gas engine. Most of the older models had an Issakson magneto for which parts are no longer available. However, Wilco makes 'will fits' which can be installed if the magneto is a problem. Old timers will appreciate the advantages of a magneto over a distributor found in newer gas engines. the Magneto performs the function of the distributor in passing the spark around to the spark plugs at the correct time, but it also integrates the coil and some generation windings as well as an impulse coupling--the latter being the source of the 'snapping noise' you hear as you rotate the pony engine. What the Magneto does therefore is to generate the electric current for the spark as well as distribute it like a distributor. This means that no battery is required, which is just as well since many of these old machines did not have a battery. The D-2, D-4, and D6 models were generally fitted with a 180 degree opposed 2 cylinder engine mounted on top of the flywheel housing. Typically these tractors have a small gas tank on the dash board and the gas engine is started with a 'pull string' on the pony engine flywheel which is exposed through the dash board. The larger dozers used a side mount gas engine which was often crank started. In later models these machines were upgraded to an electric start on the gas motor. This was often a very crude attachment consisting of a standard 6 volt starting motor which was V-belt driven to the pony motor flywheel. These models also had a gear driven generator on the right front and a voltage regulator of a unique design that would allow the generator to work and directly power lights even if the machine was not equipped with a battery. The starting sequence for these machines first required that you get the pony motor running. This usually involved remembering to turn the gas on, as any one knows anything about Cats always stops the pony motor by turning off the gas and letting it run out instead of using the provided electric shutdown switch, because otherwise the left over gas in the carburetor will cause you grief down the road. Anyhow, once the pony motor is running you need to contemplate several controls. First for some obvious reasons you should make sure the dozer is out of gear and the main clutch is released. That is safety one-opps-one. Once this is verified, you will need to locate the throttle for the main engine, the compression release, and the starting engine clutch and pinion shifter. Except for the throttle, these are typically on the back of the main engine on the left side, though some late versions had 'in seat' starting where the controls were relocated so you could start the machine from the drivers seat. In the beginning the throttle should be in the locked off position. This was likely the position used to shut the engine off the last time it was running and it should stay there for the moment. The first job is to spin up the Diesel engine. this involves releasing the starting engine clutch--it should have been left in the 'released' position. This lever engages in one direction and has a clutch brake in the other. Typically you pull the clutch lever sharply to the rear to set the clutch brake and pull the pinion lever up which snaps the starter pinion into the flywheel ring gear. It should latch there, and you can let go of the pinion lever and it will flop back down. Now engage the starting engine clutch and that should spin up the main engine. It it is reluctant to spin up, you can open the compression release which is a flip lever nearby, which will make the engine spin easier and therefore less likely to stall out the pony motor. Some of the Older larger Cats have a 2 speed shifter which allows you to first spin up the motor in low gear to get it warmed up and use to the idea of turning over. Once the main engine is spun up you should close the compression release so the engine can get used to the idea of building up compression and warm up faster. The oil pressure gauge should begin to register oil pressure and the fuel pressure gauge (usually mounted on the side of the engine) should move over to the green. Now you ultimately start the main engine by simply opening the throttle. The diesel should catch and when it does the pinion will kick out, and you simply release the starting engine clutch (because that is the way you leave it) and shut the gas off on the pony motor. The issue that I slipped right buy is the length of time that you should spin the diesel before starting it, or more accurately before it will start. The required time period will range from none at all if the engine is warm, to 10 or 15 minutes if you are dealing with freezing weather. The time will also depend somewhat on the condition of the engine. Well worn engines have even less compression that tight ones. Continued cranking handles warmup of these engines in several ways. First, the engines share the same water cooling system so as the pony engine warms the water it circulates into the main engine warming the cylinder head. A good test of when the diesel is likely to start on a cold day is when you can begin to feel warmth to the touch on the rear of the main engine cylinder head. Additionally, the water jacket goes forward and wraps around the fuel filter housing. This means as the water jacket warms up the fuel is warmed. This is extremely critical in subfreezing weather. These days we can buy winterized fuel with a lowered waxing point or treat the diesel to lower the waxing level, but this was not historically the case, so these old Cats will work with standard black diesel at fairly low temperatures. Our Old D-4 was equipped with a half inch diameter fuel line from the fuel tank to the filter assembly, so if the fuel would flow well enough to make it down a half inch pipe, the machine could run. Finally, the pony motor exhaust is routed in a heat exchanger fashion down the inside of the main engine intake manifold thereby heating the air being taken into the main engine. This warm up sequence is also one of the reasons that these engines run for years and years. Baring a bearing failure, the usual things that renders a diesel engine finally out of service is the inability to get it started. With modern direct electric start engines, the time you have to get the motor running is determined by the health and size of your battery, and longer you crank the more likely you are to melt the starting motor and kill off the battery, but that the gas engine start, the longer you crank, the warmer the engine gets so time is on your side. Of necessity you crank it longer when it is colder warming it up even more, and of course the engine has always spun up enough to have its oil pressure up BEFORE it starts. The new way of 'turn the key and go' is a step forward only in terms of operator convenience. It is not necessarily the formula to reduced engine wear.